← What is this? A card for no reason? The challenge this week at Papertrey Ink was to use layers. This card came together quite quickly until I started stamping the flowers and foliage. It was only after I had stamped everything, that I remembered that for these builder type floral arrangements with matching dies, die cutting and THEN stamping is the only way to success. I had to start over but when I put it all together, I was very happy with the result. Posted on November 27, 2017, in Card Samples, Challenge Entries, Debbie's Challenge Entries, Oscar's (Deb's) Card Samples. Bookmark the permalink. 8 Comments. Really great card. I love those tiny little deer in there. Cheers. Lovely layered card, Deb. So pretty. Deb, your layering is magical! Beautiful card. So beautiful! I love the deer silhouettes in this snowy scene! Oh this is terrific, Deb…love the focal image and your beautiful flowers, the deer just pop!! 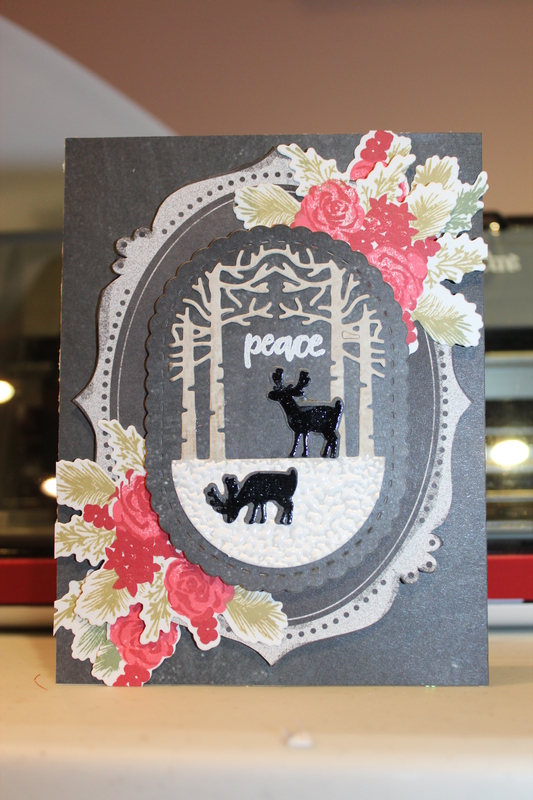 What a lovely and peaceful scene you created here on your beautiful card, Deb! Wonderful card! Great layers and neat snow too.